Submissions: Artists are required to provide images showing four different samples of current work including an image of the artist’s booth. Any format including website is acceptable. Please provide a description of work and price points. Each Artist is required to have a booth that is professional in appearance (see Exhibit Spaces). Mailed submissions will be returned only if the artist encloses a Self Addressed Stamped Envelope. Price points are absolutely necessary to process the application. Deadline: Applications will be accepted until the show is full. Jurying will begin in April, again in May and will continue in July and August until all spaces are filled. Acceptance: There is no guarantee that a returning artist will be accepted unless you have won an award in the previous year. Returning Artists Notice of Acceptance: End of April 2019. First Round Jury Review & Notice of Acceptance: End of May 2019. Late Round Jury Review & Notice of Acceptance: End of July 2019 and ongoing. NOTE: We will continue to accept applications until full. If you are not selected for the festival, the BDA will refund your application fee, less the jury fee. Set-Up Time: After 4 a.m., Saturday morning. Once set up, artists must move vehicles to designated parking area. It is important that artists move their cars to a designated space by 9am to make parking available for visitors to the festival. Cars may be ticketed for parking beyond the allotted time. The Brunswick Downtown Association, (BDA) is a 501(c)3 non-profit organization. 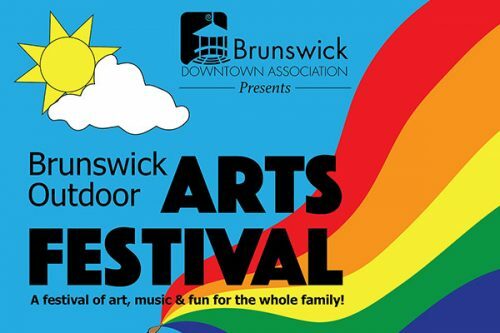 This will be the Twelfth annual BRUNSWICK OUTDOOR ARTS FESTIVAL (BOAF) to be held on August 17, 2019 from 9 a.m. to 5 p.m., on the sidewalks of Maine Street in Downtown Brunswick and Mall (town green). The purpose of this show is to foster an appreciation, interest and exposure to the arts in Downtown Brunswick. The BOAF is beneficial for the BDA, Town of Brunswick, attendees and the artists participating. All resources available are utilized to insure the Festival’s success. Our festival is run entirely by volunteers organized by the BDA. Important to note, the BOAF was designed by Artists for Artists. Entries are classified in categories and juried by working professionals and/or teachers in the field. A total of 90 + artists will be selected from the top entrants. Each category will be represented to form a balanced show. Prizes and Recognitions will be awarded by a panel of judges who are all authorities in the field of art. Judges may re-assign a category as they determine appropriate and may adjust categories as they determine appropriate. Best in Show award recipient is NOT eligible for other awards. Eligibility: The show is limited to fine art and fine craft only. Price points are a consideration in the jury process, especially for craft and Jewelry. Incomplete applications will not be processed. We ask the majority of work be originals. No booth may display or sell work that is not created by the artist who was juried. Entries can be made in the following categories: Painting (all); Mixed media; Graphics/Drawing; Photography; Craft (all), Jewelry and Other if needed. Artists may only enter one category for judging. Judges reserve the right to adjust a category designation chosen by the artist and/or adjust a category for an award to other, if a category selection is below 5% of the show. Works shown must be comparable in style and quality to those viewed by the Jury Committee. Artists may show more than one medium, but should submit examples of each medium they plan to exhibit. A submitted application is a commitment to show. Spaces may not be sublet or sold to other artists. Participants must exhibit in person during scheduled show hours. Leaving early without an acceptable excuse will make exhibitors ineligible for admission to future shows. Written cancellations received by May 31, 2019 will be refunded as follows: the booth fee minus a $50 processing fee and the $15 jury fee. Cancellations after this date will NOT be refunded. Exhibit Spaces: Exhibit spaces measure at least 10’ x 10’, are located on the sidewalk and are selected at the discretion of the Committee. If you are requesting space next to another exhibitor, this must appear on both applications. If returning artists apply by March 1st, they will be located in their approximate previous position unless otherwise requested. We will accommodate artists as best we can, but we are not able to guarantee a requested location. Please note: No space is perfect. There may be defects that need to be overcome such as uneven sidewalks, trees, crosswalks, hydrants, garbage cans, sign posts, street lamps, mail boxes and other exhibitors. Please avoid blocking crosswalks and sidewalks or risk being asked to move your booth. If there is a problem, please contact the BDA booth before you finalize your set up in the event you are required to move. All participants must provide their own display, sturdy enough to withstand crowds, wind and weather conditions, and must be securely weighted down. Please be prepared for uneven ground. Tent heights should not exceed 10 feet, as they may not fit under trees. Since the show is held outdoors, electricity cannot be provided. The show is on the sidewalks, so you will not be able to use stakes and may not attach to any trees. NO ARTIST WILL BE ALLOWED TO PARTICIPATE WITHOUT AN APPROPRIATE DISPLAY OR IF BOOTH REQUIREMENTS ARE NOT MET. Any artist setting up without an appropriate display will be asked to leave. Each exhibitor is responsible for his/her own property in the event of loss, damage or personal injury, and is asked to keep his/her space clean. Fees/Tax: This year, we are only accepting credit card payments via pay pal and online registration. You can find the link to our website, brunswickoutdoorartsfest.com/just-for-artists. We are not accepting checks. If for some reason you are unable to register on line, the BDA office will assist you. To do business in Maine, exhibitors must have a currently valid Maine Sales Tax number. You can obtain a Tax Number from the following web site: https://www.maine.gov/online/suwtaxreg/. Further information will be sent to those artists who are selected to show in this festival via our Facebook page, and our website. No regular mail will be sent and only a few emails. For questions or inquiries contact the BDA office, or Keith A Garovoy at mailto:kgarovoy@gcclihtc.com. For questions regarding booth assignments contact Roxane Rathje at mailto:roxanerathje@gmail.com. Once you have read the Rules & Information page, CLICK HERE to complete the 2019 Exhibiting Artist Registration.